New Delhi: The Rajasthan high court has stayed an attempt to get an FIR registered against Twitter’s CEO Jack Dorsey. A case had been filed against him for apparently “hurting religious sentiments” and “defaming Brahmins,” reports DNA. This was after a photo of Dorsey standing in a group and holding a poster which said “Smash Brahminical Patriarchy” was posted on Twitter. 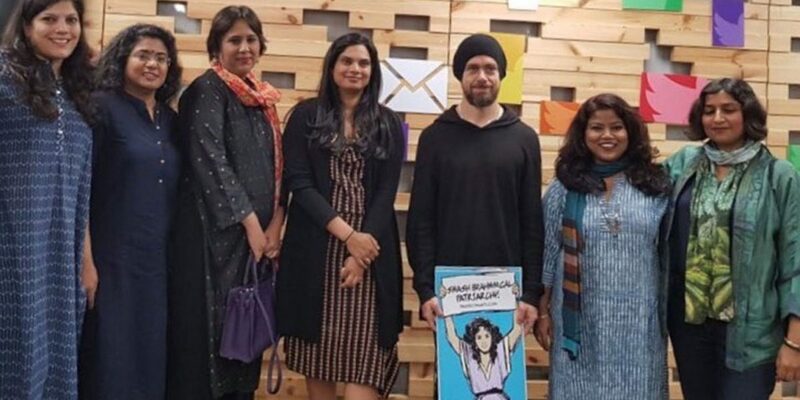 The photo was taken at an interaction that Dorsey had in India with a group of Indian women to understand how they were using Twitter and what problems they were facing on the platform such as abuse and bullying. A lower court had ordered for an FIR to be filed against Dorsey. The original complaint was reportedly made by one Rajkumar Sharma and metropolitan magistrate Rachna Bissa ordered the local police to go ahead and file this complaint. According to news reports, the FIR against Dorsey was registered under sections 295 A, 500 and 120 B of the Indian Penal Code which pertain to outraging religious feelings, defamation and criminal conspiracy. Their statement said, Twitter is a platform where “marginalised voices can be seen and heard, but we also have a public commitment to being apolitical. We realise that this photo may not accurately represent that commitment”. On Dorsey’s recent trip to India, he met a range of leaders including Narendra Modi, Rahul Gandhi and the Dalai Lama.